Alfalfa leaf contains a broad spectrum of nutrients, including considerable quantities of protein, trace mineral and vitamins, dietary fiber and chlorophyll, which serves as an antioxidant in the bloodstream. Alfalfa sprouts are a staple of salads and contain nutrients, but the leaves hold the best healing potential and contain phytoestrogens that could be beneficial in menopausal and breast feeding women. Chemicals in alfalfa called saponins can help lower blood cholesterol (by impeding intestinal absorption) without affecting heart-healthy HDL cholesterol. 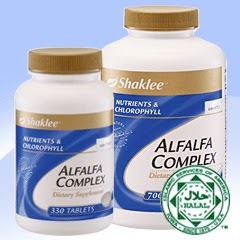 Alfalfa for : Menopause-related cancers.